Almost everything should go in the “general configuration” section. There might be some commands (those which produce output, etc.) that you only want executed when the shell is interactive, and not in scripts, which you can put in the first “conditional section”. I don’t see any reason to use the rest. You can drop the “echo” lines, but keep the “:”s — they are commands which do nothing, and are needed if that section is empty. For bash, put stuff in ~/.bashrc, and make ~/.bash_profile source it. For zsh, put stuff in ~/.zshrc, which is always executed. Thanks to this blog post and the manpages for information and ideas. I’ve referred people to this blog post several times. This is an amazing reference. Great table; I found this very helpful! One minor quibble: you say “For zsh, put stuff in ~/.zshrc, which is always executed,” but .zshrc is not always executed. Do you mean .zshenv? Either way, I think there is a good reason to use both files: .zshenv should never write anything to stdout. If it does, then things like “ssh [myhost] [mycommand]” will return unexpected results. However, it may be necessary to set up some environment variables on [myhost] before running [mycommand] — this is what .zshenv is for! Anything else, particularly anything that writes to stdout, should go in .zshrc. Thanks. I guess when I wrote that, I only cared about interactive shells, and only wanted not to have to bother about login versus non-login shells. If you notice, the instructions for Bash similarly only cover interactive shells. :-) Actually, Bash doesn’t even have the equivalent of ~/.zshenv which is executed for non-interactive shells, so IMO it’s not crucial. I’m not convinced there is really anything I absolutely want done on remote systems when running things like “ssh [myhost] [mycommand]”, but yes, if someone wants it then it’s a good idea to mention it in the post as well. Awesome article, I’ve been looking for this. People are lazy to read manuals etc… It can’t be more simple. Thanks. thanks a lot. the post is informative. Really cool. Thanks I’ve gone ahead and added it to the article. Nice start, but you still need to account for /etc/bashrc, /etc/bashrc.local, /etc/bash.bashrc.local, /etc/rc.common, /etc/rc.conf, /etc/rc.local, and more, depending on system. 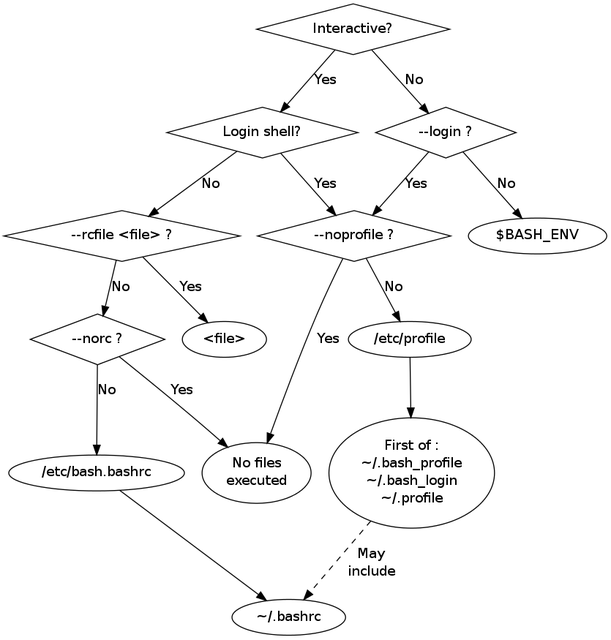 :-) E.g., for bash on Mac OS X 10.8, /etc/rc.common loads first, then /etc/profile then /etc/bashrc (there are no bash. *), etc. This is really great! Thanks a lot for writing this up.